This is a personal genealogy site of Jean-Pierre Weidert, Luxembourg. The family tree on this site mainly contains relatives - close, distant and very distant - of our family, but other more indirectly linked lines are also included. My main interest lies in the Weydert / Weidert lines and their possible connections. 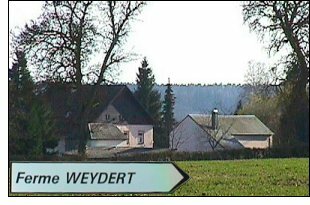 It is believed by genealogists that all of those lines go back to the Weydert farm near Larochette, Luxembourg. Geographically, the area covered by the tree on this site is mostly Luxembourg and the United States. A few branches also connect to France, Germany and Belgium. Select the Surnames entry in the left side menu or enter a name in the search form. More information can be found on the "Help" page. The family tree data are from (a) own research of original Luxembourg sources such as parish, civil and census records, (b) family records, (c) exchanges with relatives and researchers, (d) published family trees anf family books and (e) information available on the Internet. The tree on this site does not include source references or notes. Lists of people and places are freely available. The access to person and family details requires however an identification. A user account can be requested on the Login page. Please see also our important notice. To contact us, send us a personal message via the contact form.